Sonyanga Ole Ngais speaks about the similarities between cricket techniques and hunting methods and how his Warriors side uses cricket to create awareness of social issues. 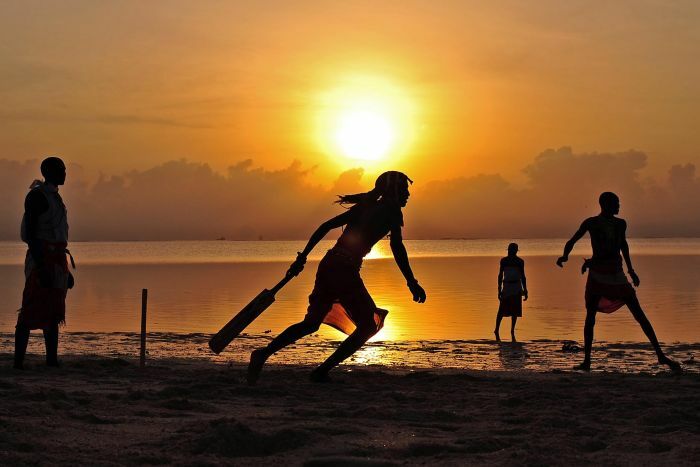 A cricket match with a difference will take place in Sydney on Thursday night. 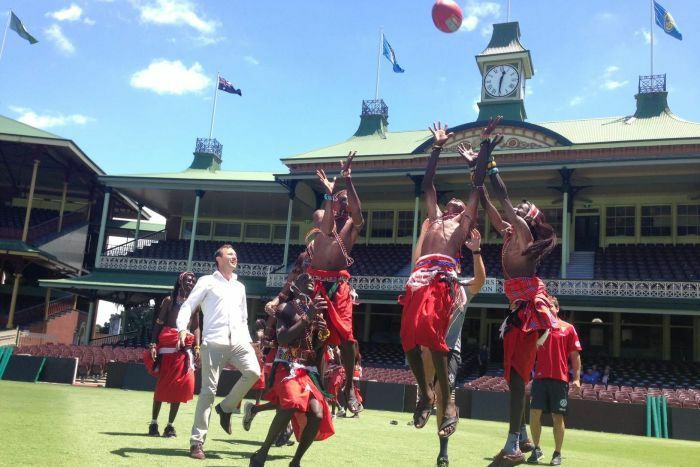 Former members of the Sydney Swans will be in action against a team from Kenya, who tour the world to raise awareness of social issues in their home country. The Maasai Warriors campaign against female genital mutilation and substance abuse, while promoting conservation in their homeland. Today the two teams met for a training session on the hallowed SCG turf. Swans’ dual premiership player Jude Bolton says it is great to play host. “Just to have a side like the Maasai Warriors cricket team here who are raising some of the social issues happening in their home country, it is extremely special,” Bolton said. The bare-chested Maasai Warriors team, dressed in their traditional tribal attire, certainly set themselves apart playing cricket, one of the world’s most traditional sports. 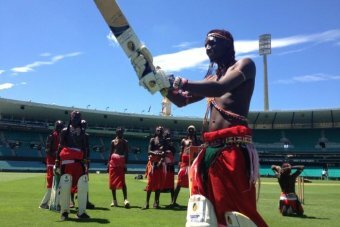 Maasai cricketer Sonyana Mike said members of the team grew up wanting to change what many consider to be culturally unacceptable. “We use cricket as a tool to spread the word on our citizens” he said. The Maasai are a nomadic tribe who come from Kenya and surrounding parts of Africa. In their society women get limited education, are usually subjected to genital mutilation, and are married off by their family at a young age. A documentary of the team will also be released this year, which includes footage of the side’s recent tour of England where they participated in a similar match at the home cricket, Lord’s. Since they first started playing cricket in 2007, the Massai Cricket Warriors have become a semi-professional team, traveling the world and promoting social change. Captain Sonyanha Ngais said that while cricket was new to Massai tribes, some of the skills involved were part of ancient traditions. “Bowling is just like throwing a spear, and batting is like using a shield to protect yourself,” he said. The Warriors grew up hunting in the small village in the Laikipia region of Kenya. The cricket team plays wearing their traditional red and white garments and are famous for the Aduma, a traditional jumping dance. Ngais said the jumping dance was done “mostly to impress women”, but was also used to welcome, and to celebrate. “Well the guys compete, we compete and the guy who will jump higher will win a girlfriend,” player Francis Meshame said. The team will play at the Primary Club of Australia’s annual Marathon Cricket event to raise money for sporting and recreational facilities for the disabled. Practicing on Tuesday with Sydney Swans legends, the Warriors also had a crash course in AFL. Sydney Swans legend Jude Bolton was impressed. “[An] incredible vertical leap… we saw one of the young men take a big leap at the end and do a good mark,” he said. Back home, the team has been drawing crowds from the most remote villages across Africa. This provides an important platform to promote awareness of social issues in the community. The team is working to educate people on about conservation, female genital mutilation and HIV/Aids. The team has been brought to Australia by the Primary Club, a charity that promotes access to sport for people with disability. The charity’s Jim Winchester said cricket can be a vehicle for transcending barriers. “There are over 500,000 people across the Maasai group and cricket is now just another layer in that culture,” he said. The Massai Warriors will play two T20 exhibition matches on Thursday, scored and refereed by asylum seekers from Sri Lanka. On the first day of the 2016 Sydney Cricket Ground Test Match – Australia versus the West Indies – our Primary Club of Australia President and ABC Radio commentator Jim Maxwell spoke with our new Patron and Twelfth Man Mark Taylor. [link was not working in August 2012 but the article is recreated below]. WORLD-beating disabled sailor Ame Barnbrook has won another major award just before she leaves to compete in the World Championships in England in an attempt to qualify for the 2012 Paralympics.Ame is the recipient of this year’s Sir Roden Cutler Award awarded by the Primary Club of Australia, which acknowledges outstanding sporting achievement by a disabled athlete.Sir Roden Cutler (VC, AK, KCMG, KCVO, CBE) served as Twelfth Man and Patron of the Primary Club of Australia from its inception in 1974 until his passing in 2002. Richie Benaud OBE graciously assumed this role since. Sir Roden agreed enthusiastically back in 1998 to lend his name to this special award, which the Primary Club and its members choose to present to an athlete or administrator who has performed an extraordinary service to his/her sport on behalf of people with disabilities. As part of the award, the awardee now receives a grant of $20,000 for recreational facilities for the sport of his/her choosing. Ame said she would dedicate the money to the Access Dinghy Foundation and Sailability NSW, both of which had helped her immensely over her 15 years of sailing. She was also pleasantly surprised to get a call from world champion surfer Layne Beachley recently who told her she was chosen for a $3000 Aim for the Stars grant. Ame continues to regularly train up Sydney with her sailing partner Lindsay Mason and they are set to fly off to Weymouth, England on May 26. Ame will compete in the Skandia Sail For Gold Regatta in the first week of June and then in July she will compete in the 2011 World Championships, which is the qualifying event for the Paralympics. There she has beat the other two Australian SCUD teams in order to qualify for the Paralympics. Past winners of the Sir Roden Cutler Award include Michael Milton (skiing) in 2001 and Kurt Fearnley (wheelchair marathon) in 2006. Ame’s story is a truly remarkable one. Born with Phocoamelia she has only the lower half of her left leg, a small foot and three toes, she has no arms or right leg. She uses her three toes for eating, writing, playing the trumpet and sailing. She has achieved more in her 22 years than most will in a lifetime. Ame has excelled in music, and sailing and has a degree in Creative Arts from Wollongong University. Her current aim is to represent Australia at the 2012 Paralympic Games in London.